The circle hooks my brother sent me haven't arrived yet, but I managed to get some from Ebay - were they going to be the answer I was looking for? I fished them on both a float and lead set up and as it was getting dark the ledger was away - powerful run which I gave a couple of seconds then wound into. And felt the hook pull out of the fish's mouth. Not a great start! Back out and I didn't have to wait long - for the same thing to happen again. Not what I was hoping for. 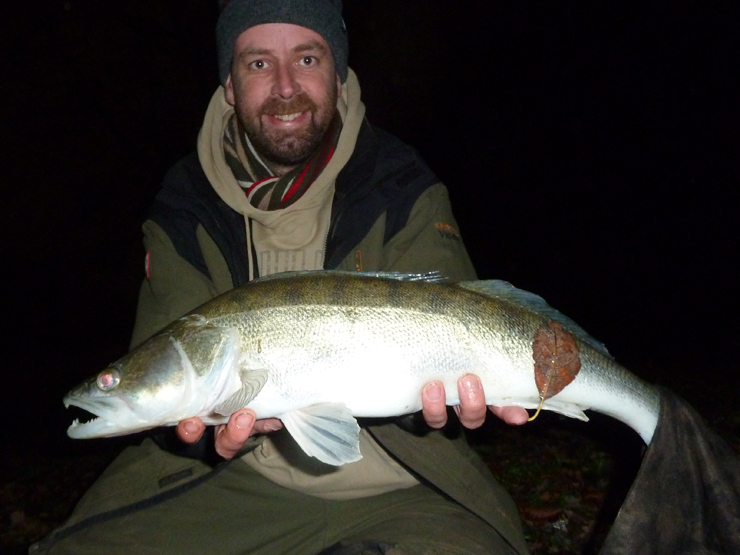 Next the float shot under, I wound down and fish on, A 3lb 15oz zander was in the net (top photo). The hook was trapped around the bottom jaw - perfect! They were on the feed and I didn't have to wait long for another run on the ledger - and pulled the hook out of it's mouth exactly the same as before. Then the float was away and I connected to this one - at least they were working on the float rod, about 2lb. But the hook wasn't trapped around the bottom jaw it stuck in the top of the throat and as I reached in with the forceps it fell out on it's own. I had more runs on the lead and didn't connect to any of them. Perhaps the gap between the point of the hook and the shank wasn't wide enough? Perhaps I need to give the hook more room to turn by using a crimp or a bigger loop knot? My plan wasn't working. I had another run on the float, and it was hooked (trapped) perfectly. 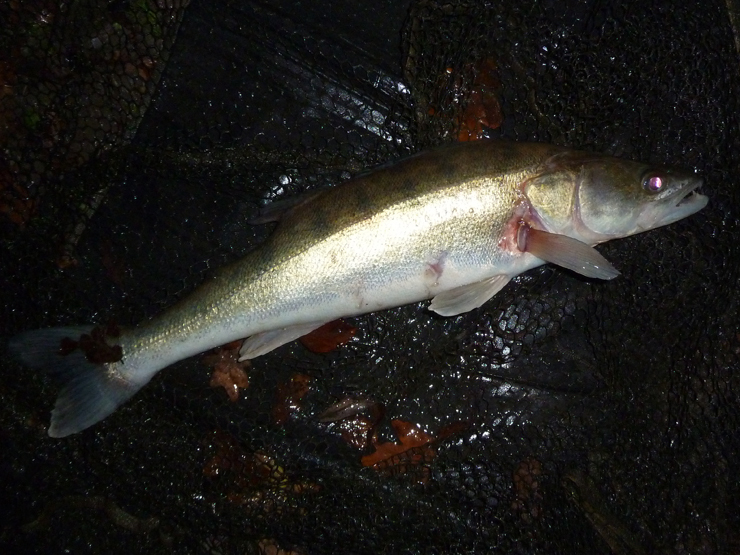 A 4lb 8oz fish above - nearly got it all out of the weigh sling for a photo! Eventually I hit a fish on the ledger, about 2½lb, but this one was hooked in the throat. Circle hooks aren't the easiest of things to unhook from here, you need to double it back on itself - two pairs of hands would be nice. I got it out with minimal fuss - but if it was an inch further down I would have struggled. I'd had over 20 runs and landed 4 fish - this wasn't the leap forward I was expecting. I'm looking forward to receiving the hooks from the States for some more experiments - especially with hook gape and movement. 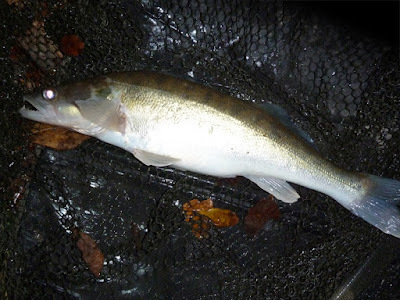 And I have a few other ideas as well as some suggestions in the comments on my other zander posts - but for the last hour I gave up and put J hooks on both rods. Just one run, and as I picked up the rod my brain was saying "remember to strike, remember to strike" - I connected to the fish. 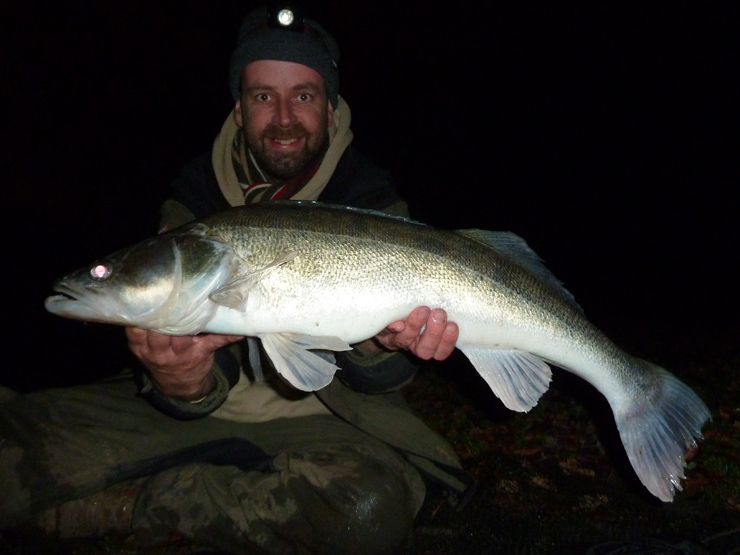 All the zander tonight fought hard but this one was really gave it some, it surfaced in front of me before hammering off again - a double!? I breathed a sigh of relief when it slid over the net without shedding the hook - it had made up for all of those failed hook-ups. On the scales she went 9lb 1oz - equalling my PB - or so I thought at the time - comparing the photos (split left pelvic fin) I'd recaptured my PB! 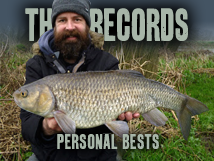 I was still delighted and I've taken the Predator Challenge to over 200lb. 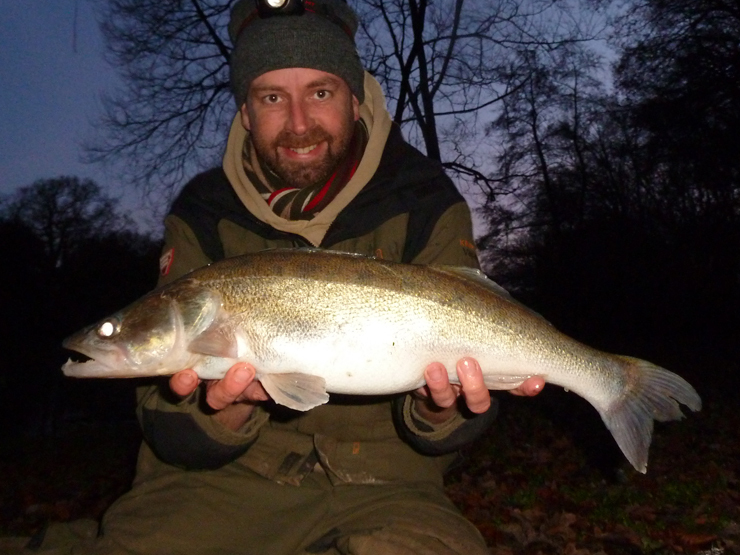 I realise I still have a lot of experimenting to do to improve my zander hook-up rate, but that's half the fun of fishing - there is very rarely a quick fix. And as a bonus there were no ghosts about tonight! I think the circle hooks would work great IF you were allowed to use an appropriate size for the target fish. Seems a maximum of a size 4 is kinda silly for a predatory fish that gets well into double figures. I agree. I know the fishery policy is for the protection of stock so trebles are banned and that's all to the good, but I'd like to go down and show the fishery owner what large single hooks can on trial. I think he'd be surprised that large hooks are safer than small ones that have a tendency to hook up anywhere they can, including the throat. Where a 2/0 will tend to find the jaw most times. If I hadn't blogged the process I'd go down with size 1 circles and plead ignorance if I was caught - then at least I'd know what the solution is even if I'm not allowed to use it. I really think hook size was the problem - I'll retry the experiment when the wide gape ones arrive. I had a good look in their mouths and their bottom jaw bone is pretty thick - the circles wouldn't have grabbed the nine pounder, it simply wouldn't fit around it's jaw. Jeff - perhaps you should pop down and show the owner your findings - you can do it during the day because the zander don't want to play until it gets dark. Also, the ghost is creepy as hell. Any explanation for it? 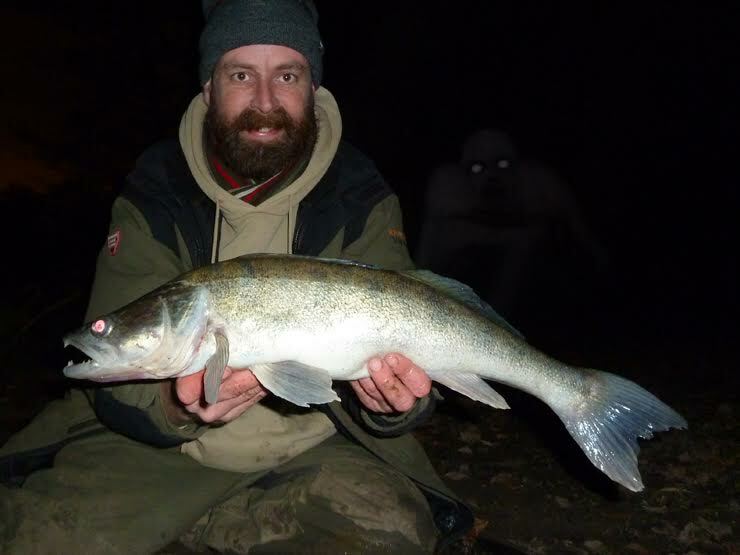 Either a monster sneaking up behind me, startled by the flash or something on the lens. For sanities sake I'm opting for the second one! What is the gape size from point to shank Brian? Those I use currently have a gap of 11mm and I believe the hook is size 1. I'm thinking of increasing to 2/0 or 3/0 because I'm sure that really large zander require that size of circle hook precisely because of the problems you've encountered here. I'll get the measurements when I get home - or perhaps tomorrow as it's work Xmas party tonight, probably won't be an accurate measurement after a few drinks. But size 4 is the maximum size allowed, so any solution has to work around that. Brian have you tried putting the hook on a small split ring so it has movement in all directions? It should make it harder for the hook to be dropped. No, I am going to experiment with the way the hook is attached for maximum movement - crimped, loop knots etc. The wire is really soft (49 strand) so I didn't think it would be an issue but it clearly is. The other issue is I really don't want them swallowing a circle hook - I've turned one problem into two! I've got some small split rings somewhere so I'll rig some up - thanks. Your other option is to gap the size 4 yourself. 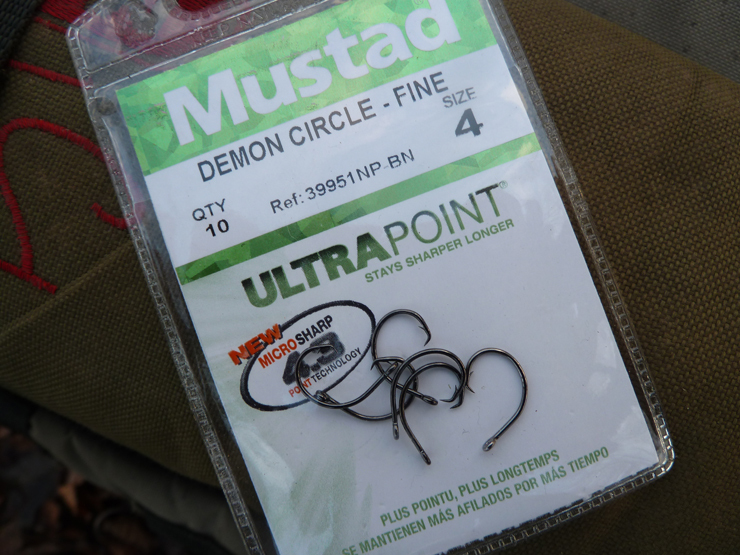 I do it to the 15/0 mustads I use as the gape they come with is too small for a good sized sharks jaw and to put on a thick fist sized chunk of stingray. Not sure how you'd do it with such fine wire hooks though. I use two pairs of mole grips. 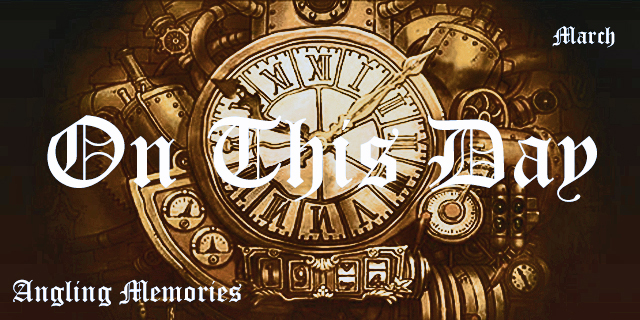 Glad to see nothing changes with you two. The 9.01 should be nicknamed "the pet"!. Top fishing Zander man, I will hopefully get a bite on Saturday. She's ready and waiting for you on Saturday... Say hi from me!